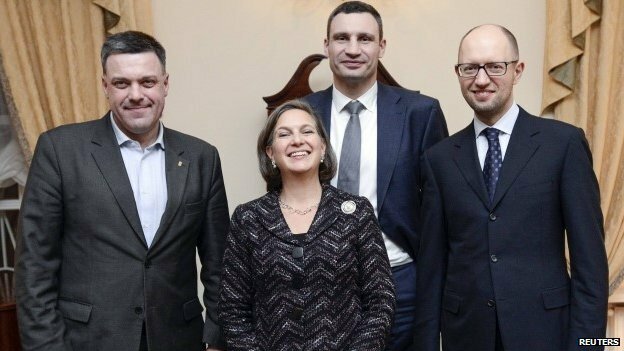 The US and the EU are supporting the formation of a coalition government integrated by Neo-Nazis which are directly involved in the repression of the Ukrainian Jewish community. There are about 200,000 Jews living in Ukraine, most of them in Kiev. This community is described as “one of the most vibrant Jewish communities in the world, with dozens of active Jewish organizations and institutions”. A significant part of this community is made up of family members of holocaust survivors. 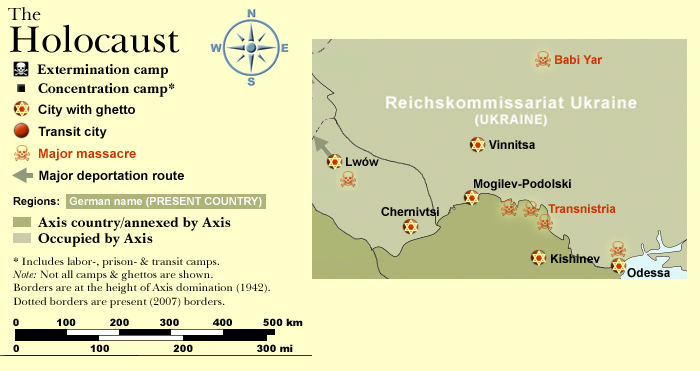 “Three million Ukrainians were murdered by the Nazis during their occupation of Ukraine, including 900,000 Jews.” (indybay.org, January 29, 2014). Ukrainian Jews were the target of the Third Reich’s Einsatzgruppen (Task Groups or Deployment Groups) which were supported by Ukrainian Nazi collaborators (Wikipedia). These “task forces” were paramilitary death squads deployed in occupied territories. While the Western media has not covered the issue, the contemporary Neo-Nazi threat against the Jewish community in the Ukraine is real. 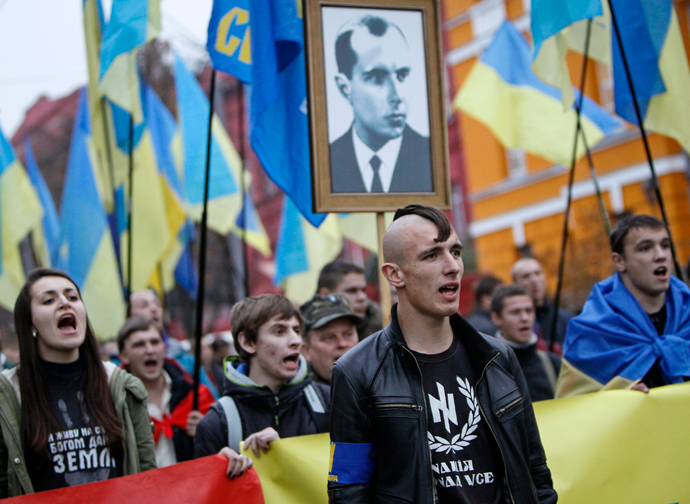 Ukrainian Neo-Nazis pay tribute to Stepan Bandera, a World War II-era Nazi collaborator who led the pro-Nazi Organization of Ukrainian Nationalists (OUN-B). 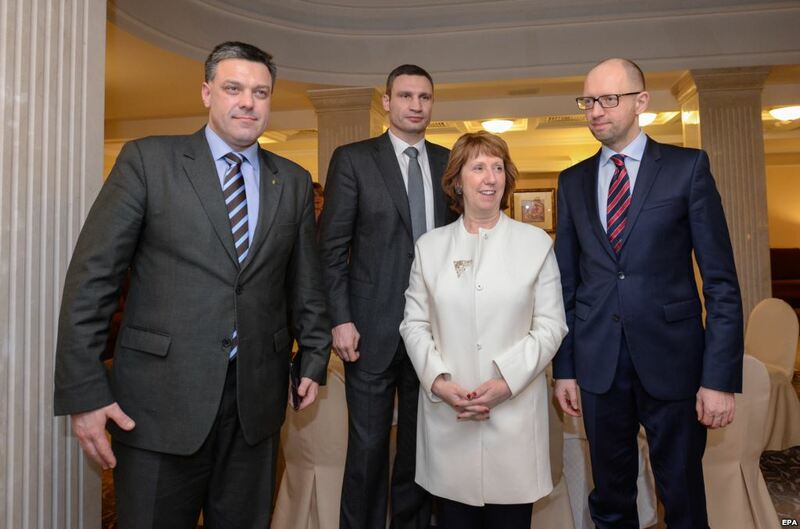 The contemporary Neo-Nazi Svoboda Party which is supported by Washington follows in the footsteps of the OUN-B. “Ukrainian Rabbi Moshe Reuven Azman asked Kiev Jews to leave the city and, if possible, the country, due to fears that Jews might be targeted [by Svoboda Brown Shirts] in the ongoing chaos. … Some Jewish shops have been vandalized and other threats to the Jewish community have been received. The leaders of the Ukrainian Jewish Community contacted Israel’s Foreign Minister Avigdor Lieberman requesting the assistance of Israel. (Edward Dolinsky, head of the umbrella organization of Ukraine’s Jews). Israel –which is unofficially a member of the Western military alliance (US-NATO-Israel)– has remained mum on the subject: Real Politik Uber Alles. 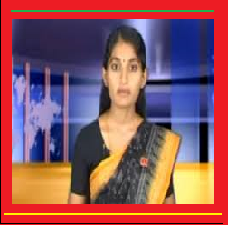 No statement has emanated from Tel Aviv. The Israeli government has not responded to the request of the Ukrainian Jewish Community nor has it made any statements. America’s pro-Israeli lobby The American Israel Public Affairs Committee (AIPAC) has not taken a stance on the issue. Not a word from Israel’s Prime Minister Netanyahu. 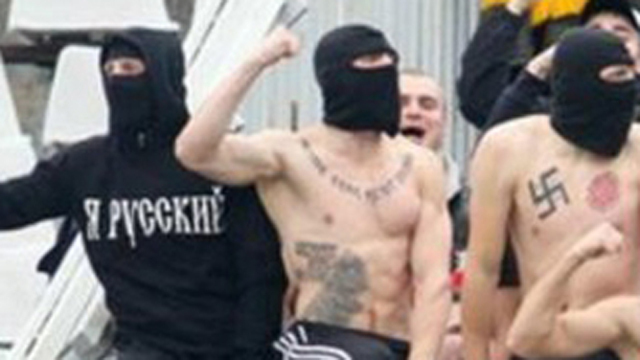 Within the Western media, news coverage of the Neo-Nazi threat to the Jewish community in Ukraine is a taboo. There is a complete media blackout: confirmed by Google News search, mainstream coverage of the threat to the Jewish community in Ukraine is virtually absent. The protesters represent every group of Ukrainian citizens: Russian speakers and Ukrainian speakers (although most Ukrainians are bilingual), people from the cities and the countryside, people from all regions of the country, members of all political parties, the young and the old, Christians, Muslims, and Jews. Every major Christian denomination is represented by believers and most of them by clergy. The Crimean Tatars march in impressive numbers, and Jewish leaders have made a point of supporting the movement. In its broader coverage of the Ukraine “protest movement”, the Western media has failed to acknowledge the nature of the opposition, casually referring to “radical elements”. What is not mentioned is that these “radical elements” supported and financed by the West are Neo-Nazis who are waging a hate campaign against Ukraine’s Jewish community. “Although there is “no information of Jews being targeted” as of yet, Jewish institutions are under self-imposed lock-down”. “There is currently “no information of Jews being targeted, but there is a danger because of vigilante groups,” Chief Rabbi Yaakov Bleich told The Jerusalem Post on Sunday. “We have not seen any random attacks and we hope people are basically interested in law and order and not in mayhem,” he said, expressing his hope that protesters would begin turning in their arms tomorrow as scheduled. … There is a great deal of uncertainty among Kiev’s Jews, said one community member, speaking anonymously.She said that while there has been no direct threat against Jewish institutions, two Jews were attacked during the protests and the general feeling of insecurity pervading the city has affected its Jews as well. The two incidents of anti-Semitic violence since the beginning of the protests, he alleged, were most likely provocations by the government looking for a pretext to clamp down on its political opponents. “There is no real special danger for the Jewish community due to anti-Semitism from protesters,” he said. According to the JP, the issue is one of “transition”, which will be resolved once a new government is installed . Ironically, while the Israeli media dismisses the matter, the Arab media has provided a far more balanced assessment of the threat to the Jewish community in Ukraine. Rabbis in Kiev and across Ukraine spoke out, warning their congregations to stay off the streets and remain in their homes. The Jewish Agency in Jerusalem has moved swiftly to offer aid to elderly Jews living in greater Kiev. Food-delivery men are braving gunshots and Molotov cocktails to help them. 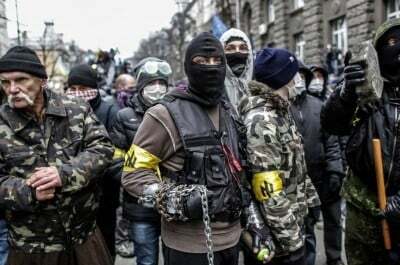 Reports from Kiev say the police have been replaced by roving bands of undetermined loyalty. 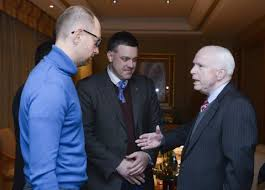 Ironically, while renowned scholars critical of the State of Israel for violating the fundamental rights of Palestinians are accused of being “anti-semitic”, nobody bats an eye lid when John McCain (see image right with the leader of the Neo-Nazi Svoboda Party Oleh Tyahnybok, centre),Victoria Nuland (image above together with Oleh Tyahnybok, left), EU foreign policy chief Catherine Ashton (also with Oleh Tyahnybok, left), John Kerry, Francois Hollande and Angela Merkel (among others) openly pay lip service to Neo-Nazism in the Ukraine. Is the Western media “anti-semitic” when it fails to report crimes committed against the Jewish population in Ukraine? Is the self-proclaimed “international community” anti-semitic when it upholds in the name of “democracy” a “protest movement” led by Neo-Nazis? Is Netanyahu an anti-semite by tacitly supporting US-EU-NATO geopolitical interests in Ukraine, with total disregard to the rising tide of fascism and anti-semitism?